Leading up to E3, rumors flew in every which direction about Fallout 76. Some thought it would be a base-building spinoff that refined the settlement features in Fallout 4. Others thought it would be a multiplayer survival game. The actual answer turned out to be both. Fallout 76 is a multiplayer survival game with settlement features, and according to Bethesda, the map is a whopping four times the size of Fallout 4. Ahead of Fallout 76‘s November 14 launch on PS4, Xbox One, and PC, let’s take a look at the nuts and bolts of Fallout 76‘s apocalyptic wasteland. Fallout 76 is a prequel to the entire franchise. The character you create is one of the first to be sealed in Vault 76 and emerge into daylight in 2102, roughly twenty years after nuclear warheads blasted the world in what is known in the game’s lore as the Great War. Vault 76 is a test vault by design. Its inhabitants were scheduled to be studied when they re-entered the world, while many other vaults stayed safely shut. Fallout 76 is a first person shooter like recent entries in the series, but Bethesda wants you to explore West Virginia with friends. While you can play solo, all of the gameplay videos shown so far suggest that it would be hard to survive very long without a few friends by your side. Still, if you’re familiar with Fallout’s shooting mechanics and controls, you’ll feel right at home with Fallout 76. Yes, Fallout 76 is being marketed as an online survival game, but it doesn’t seem like it will be as tasking as traditional survival experiences like State of Decay 2, H1Z1, or Dying Light. If you think about it, the Fallout series has already been somewhat of a “light” survival experience anyway. Once again, you will need to eat and drink fluids, worry about weapon degradation, and radiation. But radiation isn’t always bad (in real life it very much is), as exposure can provide both positive and negative stat effects. Since Fallout 3, the series has had V.A.T.S. — Vault-Tec Assisted Targeting System. The system has evolved with each subsequent entry. Fallout 4‘s V.A.T.S. slowed down time to a crawl so users could aim at specific weak points on enemies. In Fallout 76, however, V.A.T.S. will be conjured up in real time. V.A.T.S. can be leveled up and help make up for not-so-accurate aiming by letting you target a spot on an enemy. A major reason for this change would seem to be the multiplayer focus. Slowing down time in combat with another player wouldn’t make much sense. Using the settlement features from Fallout 4, you and your fellow Vault 76 dwellers must rebuild a world that was just recently ravaged by nuclear warfare. Bethesda has offered plenty of details about how building will work. The newly introduced C.A.M.P (Construction and Assembly Mobile Platform) allows for portable building, meaning that you can build structures wherever you please — a change from the designated areas for building in Fallout 4. This includes co-op building, so you and your friends can work on buildings and share them for protection. To secure your buildings, you can erect defensive mechanisms such as turrets and traps, which will surely help to keep not-so-friendly players from breaching your camp. In a nod to other survival games, mutated animals and creatures from West Virginian folklore — such as the Wendigo and Mothman — will attack your base randomly, so keeping your buildings fortified and protected will be a necessity. And if you’re into this sort of thing, you can take “trophy” photos with slain monsters. Like Fallout 4, each camp you set up has a workshop and cooking pot. Fallout 76 won’t have human NPCs. Yes, you will encounter a variety of monsters to eliminate, but when you run into a human, it’s a real person playing at home. That might lead you to wonder — will there be quests? How will you receive them or turn them in? Exact details on this aren’t clear, but Bethesda has said there will be a band of ghouls (humans who look like zombies, due to radiation) that can speak with the player, as well as NPC robots. Though you may not encounter fellow humans as often as you’d think. Bethesda has stressed that Fallout 76 is not an MMO, nor is it a battle royale game. Speaking with Danny O’Dwyer of Noclip, project lead Jeff Gardiner said that the game currently supports 24 to 32 players on each server. You will be able to see where other players are on the map, but considering the sheer breadth of the West Virginia terrain, don’t expect to run into other players constantly. While Fallout 76 is multiplayer-oriented, you don’t have to engage in player-versus-player combat if you don’t want to. You can choose if you want PvP on or off. There is some incentive to getting into the action, though. At E3, Bethesda discussed a bounty system that would put a price on aggressive players’ heads. So if you and your friends keep getting taken out, it sounds like Bethesda will make it worth your while to retaliate. Whether you’re squaring off against other players or against a Wendigo, you won’t lose character progress when you die. When fighting alongside friends, a teammate has a chance to revive you before you actually die. And even if you die, you can choose a respawn point and hop back in. Like previous Fallout games, you’ll level through XP. Perk cards also return, which allow you to tweak stats and allocate boosts, though you can only equip a finite number at a time. You’ll also be limited on which perk cards you can use based on the attributes you assigned while creating your avatar. And yes, you’ll have you’ll very own power armor suit. The Fallout series has taken place in the aftermath of devastating nuclear warfare, but Fallout 76 will let players contribute to the ongoing destruction, if they so choose. You’ll have to scour the world to find partial codes for a launch sequence. Some of these fragments may be hidden, while others will be doled out when defeating enemies. After acquiring a complete launch code, you can key up a launch sequence and fire away at any spot on the map. The nuke will make a portion of the map uninhabitable for a bit due to radiation and will obviously destroy any settlements in the vicinity. That’s not the end of it. Nuking an area will spawn high-level mutant monsters in the level. Players can then enter the resulting wasteland, fight the baddies, and gain exclusive loot. Nukes are essentially an awesome spin on the idea of end-game dungeons or raids. In the Fallout 76 Noclip documentary, Bethesda said Fallout 76 will have microtransactions, though they will only be for cosmetic items — hence, no pay-to-win scheme going on here. In an interview with GameStar, Todd Howard said that players will also be able to earn currency to purchase cosmetic items in-game. The goal is to refrain from separating the player base, according to Howard. Also in the Noclip documentary, Bethesda said that the game will receive free updates for years. 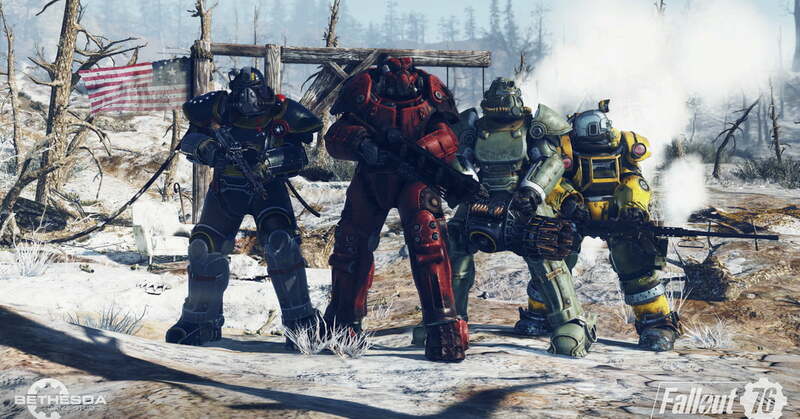 It sounds like it wants Fallout 76 to be an ongoing game in the same vein as Destiny 2, The Division, and others. At this time, it’s unclear if paid expansions will be released down the line, but everything Bethesda has said so far suggests it wants to keep the player base on the same playing field. At E3, director Todd Howard said the team is “100 percent committed” to delivering mods to Fallout 76. Don’t expect mod support any time soon, though. Howard stressed that it has its focus on making sure the online service runs well at launch. However, he did say that he’d like for players to be able to have their own maps to mod as they say fit. Fallout 4 supported mods on both consoles and PC, so Bethesda’s dedication to making mods available in Fallout 76 isn’t a huge surprise. We’ll just have to see if it comes to fruition. Fallout 76 will have a beta, or, as Bethesda likes to call it, a B.E.T.A. (break it early test application). To gain access to the beta, you have to pre-order the game. It’s unclear when the beta will kick off, but Xbox One users will get it first. When can West Virginia be my home? Fallout 76 launches on November 14 on PS4, Xbox One, and PC. What’s ahead for Nissan and Renault after Ghosn?